Blogspot is sub-domain provided by Blogger.com for it's free blog like www.senomic.blogspot.com, if you are new to blogging world then you may create your own free blog. In this article I will discuss with you, one of the most important point of SEO(Search Engine Optimization) in blogging, may be you are doing this mistake. 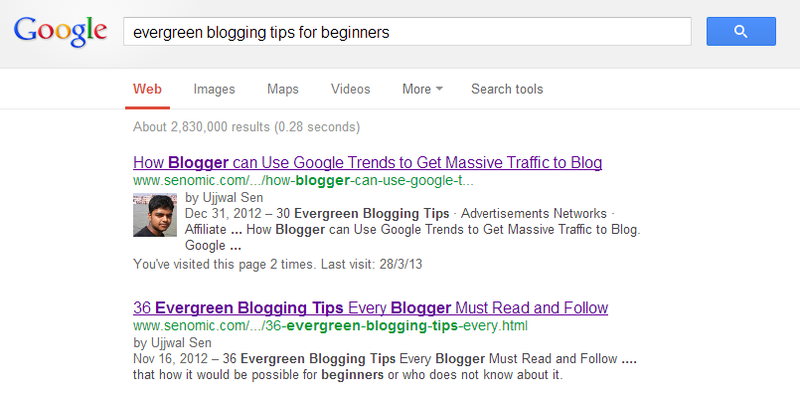 Just now I was searching about "Evergreen Blogging Tips for Beginners" on Google and I got results on Google as I have given below screen shot. 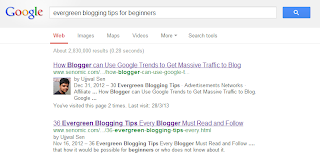 As you see first result is not matching with the query on Google because just below the title you can see "30 Evergreen Blogging Tips" on dark right? This "30 Evergreen Blogging Tips" is the label, which I have add on label on Blogspot blogging platform. Now may be you getting little bit, if you are not, then let me tell you more about it, actually search engines always read keywords on title, labels, content then search engines show results. Actually, if you want to rank better on search engines of your blog post then you have to provide quality with using these tips to get better traffic from search engines(this way of getting traffic is called organic traffic), which is the most desirable traffic by the advertisement networks. So provide labels on your each blog post to get more traffic to blog through blog post, if you are fresh newbie then let me help you more, this labels option you can see on the right side on your blogspot post box. Here is the big thing for you, don't provide any labels, which will not represent your blog post other wise search engines may banned your blog. I don't want that day you will see, because as a beginner blogger, search engine is the best way to get traffic to blog. I must not provide Labels "make money online", because this will give the wrong instruction to search engines. If search engine will come to know about this, then what will I have already mention earlier "They Will Banned Your Blog", this is happened many times, This is happening, This will happen. I am more confident about this, because Google banned BMW's website in 2006 for search spamming then they can do it for your blog too. But it will only happen, if you will try to spam search engines. In blogging hard work always pay you more, as much you can not imagine even, few times more than from your day job, to see that day, you have to do blog post consistently, you have to give more time to it, to improve your article quality. That's why people will come to your blog again and again, this is the most important thing in blogging. Because to take a business to the next label repetition of customers are needed and blogging is a real business. See there is no other short cut way to make money online, you have to do hard and genuinely, don't even try to spam, because internet world is more smart than you. Keep blogging that day will come dear, don't worry be working on your blog, invest money to make it better. I agree, blogging takes hard work and great patience. With the proper SEO techniques you can see results in portions, though not immediately. Thanks for this interesting read. You should give PrimeView.com a visit. They have amazing articles regarding SEO techniques. Thanks for this post on how to move from blogger to wordpress without lossing any traffic, and it’s really worth it.